Below are reproduced two pages of information from a leaflet on Enderby House produced by Standard Telephone and Cables when they were the owners – it is not dated but I would guess 1970s. (Sorry about the quality – my current scanner has refused to OCR it, although I could have done it with an earlier machine, for which Microsoft no longer produce drivers). 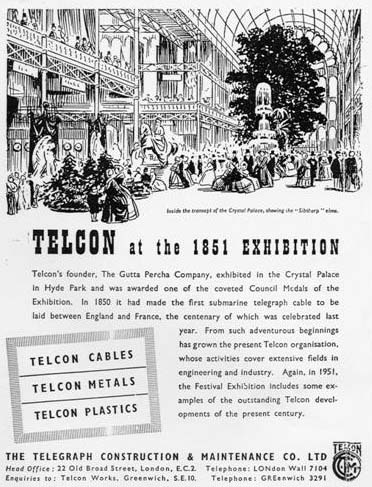 The following article on Telcon (its modern successor is Alcatel on Enderbys) appeared in a brochure on Greenwich industries produced by the Metropolitan Borough of Greenwich in 1951 for the Festival of Britain. The story of Telcon begins with the production and development of submarine cable. A man called Kuper had a wire rope factory in Camberwell and obtained the order to armour part of the length of submarine cable which was laid across the Dover Straits in that memorable year, 1851. He soon realized that the production of submarine cable demanded riverside site, but as the area flanking the Thames had become built up as far down as Deptford, he rented Morden Wharf, lower down the river in Greenwich. Kuper & Co. armoured submarine cable and made wire rope here auntil 1854 when they were taken over by two men named Glass and Elliot, who founded the firm of Glass, Elliot & Co. Ten years later-in 1864-this company amalgamated with the Gutta Percha Company of Wharf Road, City Road, North London, to bring into being the Telegraph Construction & Maintenance Company, Ltd., now known as Telcon. The laying of the successful cable across the Straits of Dover in 1851 fired the imagi nation of ambitious engineers, and by 1866 the Great Eastern, at the second attempt, laid the first successful cable across the Atlantic- made by Telcon at Greenwich. Now nearly half a million miles of submarine telegraph and telephone cable have been made at Morden or Enderby’s Wharf by Telcon and its associate company, Submarine Cables, Ltd.
A part from the natural development of submarine cables and thermo-plastic products, Telcon has extended the. scope of its activities to embrace other industries which now flourish side by side at Telcon Works. There is a large Metals Division which, nearly 30 years ago, started the first induction melting in this country to produce high-grade magnetic alloys such as Mumetal, Radiometal and Rhometal, which have become world-famous. In the early days, Mumetal was responsible for increasing several fold the “word handling” capacity of cables but, since then, has entered into the wide ramifications of the electrical engineering industry. It can be claimed, for example, that the bulk of the British Electricity Authority metering is controlled by Mumetal transformers and that this alloy also plays a prominent part in all telephone communication systems not only in this country, but also in many parts of the world. Since the early ’20s, Telcon metals have been produced in ever-growing quantity and variety, and there is no other firm in this country employing such a specialized team of technicians and workers engaged on the production of high-grade alloys for so many purposes.